National Geographic is the first buyer of this ad offering from Oath. Nat Geo’s agency 360i handled media planning and buying. The ads will run through November 18 in games like Skyfront and Jurassic VR. The ads show up in the games where one would expect to see them in real life — billboards, walls and other surfaces. Oath first announced the new VR offering this summer. It enables advertisers to extend existing display and video assets into fully immersive and VR environments. The offering is a partnership with Admix, which claims to be the first SSP for VR/AR, programmatic trading infrastructure BidSwitch, and Oath's DSP. National Geographic is also marketing the second season of “Mars,” which is produced by Ron Howard and Brian Grazer, in the New York subway and on television. According to Broadcasting & Cable’s weekly ranking of the most heavily promoted shows by networks, the promo for "Mars" had 240 million TV ad impressions, topping Broadcasting & Cable’s chart. 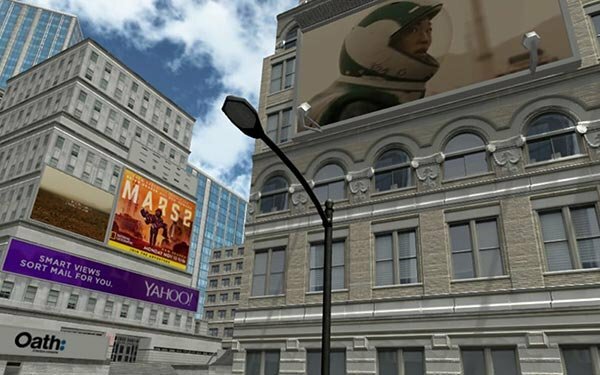 National Geographic also used VR to promote the first season of “Mars.” The company built an exhibit in Manhattan where visitors could experience virtual reality simulations of landing on Mars and walking without gravity. Oath reportedly will soon be renamed to Verizon Media Group/Oath), according to Adweek, which first reported the news.